Upgrade your OEM air filter with the best K&N air filter. Since K&N air filters are built specifically for your vehicle, there’s usually no decision to be made. If you want a K&N filter for Ford Edge vehicles, there’s only one K&N part number to choose. If you’re shopping a K&N air filter for Toyota Tundra trucks, again there’s only one part number. That’s the beauty of the K&N air filter—it’s custom made just for your vehicle. 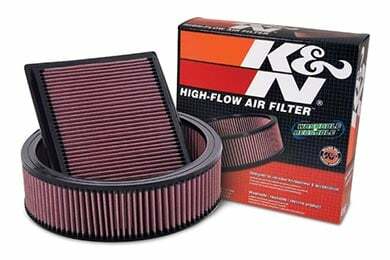 K&N also makes universal filters for a huge variety of vehicles. So, if you’re looking for a carbureted mid-80s Dodge Ram air filter, K&N has that, too. The same goes for any pre-fuel injected car air filter. Just match the size of your engine’s filter casing and get the corresponding K&N—easy peazy. The other product that you must get with your filter is the K&N Recharge Kit. Indispensable for performing the routine maintenance of your reusable filter, the K&N filter cleaning kit removes all the guesswork and keeps your filter going for the next 50,000 miles—and the next, and the next. Now, if you’ve seen the air filter competition, you may be wondering what the difference is. Remember, K&N invented the reusable air filter. So, if it’s a Green air filter vs K&N debate, or AEM vs K&N, or any one of the scads of copycat filters vs K&N, just keep in mind that they copied K&N, not the other way around. So, by simply sticking with the innovator, you guarantee yourself the best filter money can buy, backed up by 35 years of performance-filtration know how—K&N! Also, don't forget to check out the K&N air filters reviews on our site. This page is maintained by Nathan at AutoAnything. If you have any questions, leave a comment below. Reference # 754-683-116 © 2000-2019 AutoAnything, Inc.